We are writing to express deep gratitude to the Wet’suwet’en People who have been acting with formidable vision and strength to defend their people and territories from pipeline development, and have been facing violent incursions from RCMP and industry for doing so. They have been holding this line for years and caring for the lands and waters for countless generations. For us and for many others, the Unist´ot´en camp represents resurgence, reconnection, creativity, and relationship to the land. The long-term struggle of the Wet´suwet´en is a legitimate, legally sanctioned struggle for rights, autonomy and sovereignty on their unceded territories. These efforts benefit all Canadians. We send our deepest thanks. We are also writing to denounce the actions of the federal government, the BC government and the RCMP. We ask that the illegal work on Unist’ot’en territory by Coastal Gas Link be immediately stopped. We request that the federal and provincial governments respect Indigenous rights as outlined in our constitution, in countless court rulings, as well as the United Nations Declaration of the Rights of Indigenous people (UNDRIP) and ‘Anuc niwh’it’en (Wet’suwet’en law). We ask that Canadian leaders and politicians stop militarization, stop communicating false or biased information, and stop dividing communities. We reject the current campaign of disinformation, particularly statements that claim that all communities have signed on to the pipeline, which disregard the very important question of disputes over jurisdiction of territories between band councils and hereditary governance. In the Delgamuukw trial, the hereditary chiefs of the Wet´suwet´en were recognized as the rightful title holders, and their underlying sovereignty over the territory was established by Canada’s highest court. We urge both federal and provincial governments to understand the crucial distinction between consultation and consent, and to act accordingly. We firmly oppose the Trans-Canada pipeline project and other extreme energy projects being developed that are threatening Indigenous lands. According to the latest scientific evidence there is still some possibility that catastrophic climate change can be slowed or arrested, but this goal requires an immediate phase-out of fossil fuel infrastructure (Millar et al., 2017, Smith et al., 2019). And we request the Governments heed the call of scientists who have made it clear that new fossil fuel infrastructure present the source of the world’s most threatening emissions, and would carry us toward dramatic increases in global temperature (Davis et al., 2010). This applies to natural gas production and transport, because it also locks in fossil fuel use. The world needs to move straight to renewable energy sources, and as quickly as possible. Natural gas must not be seen as a transition fuel that will “bridge the gap” between high and low-carbon energy systems (Stephenson et al. 2012). Shale gas development and its related infrastructure will have very serious impacts not only on the territories of the Indigenous peoples that inhabit the province of British Columbia, but on areas of extraction in the northeast, along the territories and watersheds the pipeline will cross, and particularly on coastal communities, salmon habitat in rivers, and the remaining marine life in the Salish Sea and K̲andaliig̲wii (the Hecate Strait), that all will be impacted by increased tanker traffic. Current governance processes have failed to adequately protect environment and treaty rights (Garvie & Shaw, 2016). To meet Canada’s climate targets and Canada’s commitments to reconciliation, the Canadian government needs to stop forcing gas pipelines violently through Indigenous lands. We are also writing to encourage all Canadians to actively support the Wet’suwet’en people as they continue to demonstrate their commitment to protect their lands and waters. The most recent Intergovernmental Panel on Climate Change report has warned that we have only 12 years to meet the challenge of limiting increasing temperatures to 1.5 degrees (IPCC, 2018). Even at this historic juncture, we see no sign that our existing governments are capable of dealing with the current challenges all Canadians face. The twin crises of climate chaos and rising inequality are getting worse, not better. Research shows that substantial and swift transformation of our societies will be necessary in order to meet our climate and reconciliation goals (Scoones et al., 2015); however, our current economic and political systems are failing to heed these calls and move us toward a sustainable and just future. This is because these very economic and political systems facilitate the accumulation of wealth through the continued seizure of Indigenous land and the pillaging of the natural world. We cannot leave it to these failing systems to guide us. What is needed is inspired visions and new systems that are able to guide us toward a much more just and sustainable future. 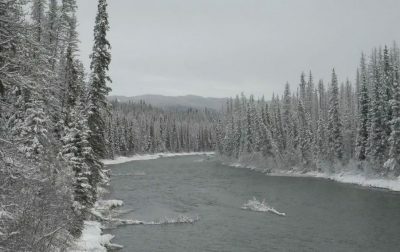 The Wet’suwet’en people, and other communities defending their lands and waters across the world, are showing us better systems of decision making, along with better ways of living together and with the land. Our best hope for justice and sustainability in Canada lies with communities like the Wet’suwet’en nation, who take their relationship and responsibilities to their lands and waters so seriously that they will risk all they have to defend it. Our hope also lies with the many Canadians respecting and actively supporting the rights of these Indigenous communities to take care of their territories. The Unist’ot’en camp houses a healing center, envisioned as a space to heal from the trauma suffered by so many First Nations in Canada due to colonial and extractivist violence. Projects such as the Trans-Canada pipeline perpetuate this violence. To invade this camp, to disrupt this space of healing, is particularly unconscionable. Canadians have pledged to work toward reconciliation to try to heal the injustices borne by Indigenous peoples; and this healing must also include the lands which we all inhabit. To begin to heal these relationships, the kind of violence seen recently in BC must end. See complete list of signatories here. To find ways you can support the Wet’suwet’en people, click here. Davis, S. J., Caldeira, K., & Matthews, H. D. (2010). “Future CO2 emissions and climate change from existing energy infrastructure,” Science , 329(5997), 1330-1333. Garvie, K.H. and Shaw, K., 2016. “Shale gas development and community response: perspectives from Treaty 8 territory, British Columbia,” Local Environment , 21(8), pp.1009-1028. Millar, R.J., Fuglestvedt, J.S., Friedlingstein, P., Rogelj, J., Grubb, M.J., Matthews, H.D., Skeie, R.B., Forster, P.M., Frame, D.J. and Allen, M.R. (2017) “Emission budgets and pathways consistent with limiting warming to 1.5 C,” Nature Geoscience , 10(10), p.741. Scoones, I., Leach, M., & Newell, P. (Eds.). (2015). The politics of green transformations , Routledge. Smith, C.J., Forster, P.M., Allen, M., Fuglestvedt, J., Millar, R.J., Rogelj, J. and Zickfeld, K., (2019). Current fossil fuel infrastructure does not yet commit us to 1.5° C warming. Nature Communications , 10(1), p.101. Stephenson, E., Doukas, A. and Shaw, K., (2012). “Greenwashing gas: Might a ‘transition fuel’ label legitimize carbon-intensive natural gas development?” Energy Policy , 46, pp.452-459.